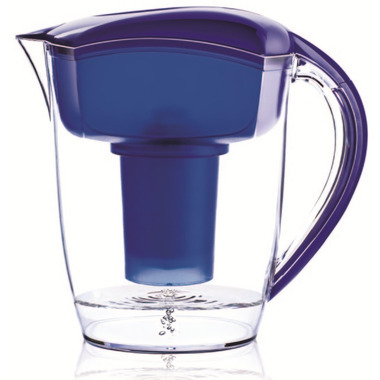 Enjoy mineralized, alkaline water at home with the Santevia Alkaline Water Pitcher. This convenient, hand-held pitcher fits in the door of your refrigerator, and restores your tap water to its mineral-rich state, just like nature intended. Using the same elements as nature’s filtration system, Santevia adds calcium, magnesium and other beneficial minerals, and has been independently tested to reduce chlorine taste and odour, heavy metals, industrial chemicals and agricultural contaminants. I have to be the "fly in the ointment" with regard to this. As a senior with a physical disability, I find this system to be awkward to set up and heavy to use. If I didn't know it was alkaline water, I couldn't tell by the taste. I would not recommend this. I love this product. It filters water quickly and tastes amazing. I love that the water is alkaline. I would absolutely recommend this to everyone. I really like this water pitcher. I use it everyday to make myself alkaline water. I find that the water tastes even better after it has been run through the pitcher. I like how quickly the water goes through, so I don't have to wait very long before I have fresh alkaline water to drink. I even started using it to make my coffee too, since coffee is acidic forming in the body.